I often get asked about what kitchen products I’m using to make the recipes on this blog. This page will share my favourites and I’ll do my best to keep this up to date for you as I use new products. I’ll also show you what is on my wishlist. If you are more interested in the resources and tools being used to support this blog (e.g. hosting, blog platform, photography, etc) then please check out our Blog Resources Page. Please note: Some of the links below may be affiliate links which means we would earn a commission from the seller if you were to make a purchase through the link. I will only share items that I personally use and would be comfortable recommending to my family and friends. Reach out if you have questions on my own experience with any of the items below. 1. 5 Pre-programmed settings including one for smoothies. I use this every day. Plus a soup setting that allows you to make and heat homemade soup. 2. It is so easy to clean. You just need to add warm water, a drop of dishwasher soap and to use the cleaning setting. 3. 7 year warranty – Need I say more? 4. 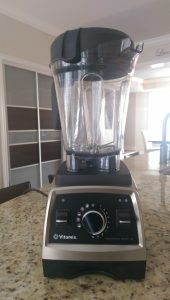 Horsepower – it blends ice better than any other blender I have ever used before. Makes blending frosty cocktails or icy smoothies a breeze. For the 5% of the time that I don’t use my Vitamix Pro this is the system that I turn to. I actually had purchased this prior to getting the Vitamix when my husband and I lived in a small condo downtown with zero cupboard space. It was to replace my magic bullet that had worn out. The pros: multiple container sizes including personal sized and a small blender jar, two blades, lids and of course the size and price. I love to use this when I’m making dip or salad dressing and I don’t need to make a huge amount. The Vitamix requires a minimum volume to really do its job. The downsides: if making icy drinks or using frozen fruit to make smoothies I would find I had to add more liquid and stop frequently to shake the jar and may still have small ice chunks. I participated in a hands-on cooking class at a local Calphalon cooking school as part of a team building event a few years ago and I’ve been using their products on the stove-top ever since as I was super impressed. The pans provide a nice even heated surface so even I have an easy time making eggs, omelets and pancakes in these pans. These pans are even rated as dishwasher safe and oven safe up to 500 degrees Fahrenheit. Better yet? Calphalon backs this product up with a full life-time warranty. My very first milk frother was just like this one. I bought it at an Epicure Selections home party and started whipping up lattes and cappuccinos as soon as I unboxed it. It works very well especially with very cold or very hot milk. Plus it gives you a little bit of an extra arm workout – nothing wrong with that! No need for expensive tools to make great drinks in the comfort of your home. It literally pays for itself in just a few uses when compared to expensive drinks you might buy at a local coffee house. Like soda or bubbles in your water? Make your own carbonated beverages at home in seconds. I use the Soda Stream system to carbonate water and to make delicious carbonated beverages. I even make my own “syrups” and flavour additives including this cranberry orange syrup. I typically make ice cream and sorbet by blending the mixture and then freezing in a loaf pan. Sometimes the result is super hard and/or icy which is not the way most of us like our ice cream. I finally have enough freezer room that I could actually freeze the ice cream maker bowl. This ice cream maker has good reviews and a decent price.